So after visiting Cwm, and the church and well dedicated to the saints Sulien and Mael, it was purely by coincidence that the following week we headed up towards Corwen, the church of which has the same dedication. Corwen is probably best known as the location of one of Owain Glyndwr’s triumphs over English King Henry II. Traditionally Corwen was the venue for a great fair held on May 13th, the feast day of SS Sulien and Mael. The well at Corwen, however, ignores poor St Mael, and bears the name of Sulien only. Actually Jones (1954) gives the name as Ffynnon Silian, probably after Lhuyd, and on Victorian OS maps the well appears as Ffynnon Sillin. Baring Gould discusses the connection between Sillin and Sulien, stressing that although in his time (start of the 20th century) the two names were used interchangeably, they are not the same, and that Sillin has in the past been regarded as a Welsh equivalent of St Giles, who enjoyed an extensive cult in England and Scotland in the 11th century. This leaves us unsure as to whether the well has always been dedicated to St Sulien in line with the local church, or whether an earlier dedication to Sillin has become confused over time and the name changed to match with the patron saint of the local church. If this were the case it may explain the dedication to Sulien only rather than Sulien and Mael as at Cwm. 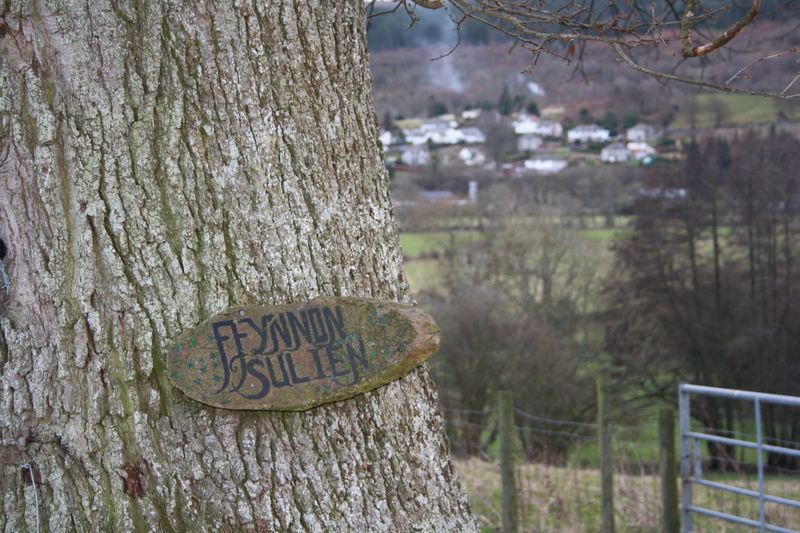 Ffynnon Sulien is a little over a mile to the north west of the parish church, and across the River Dee from the village. It is, as Lhuyd noted in 1699 ‘by Rig Chappel’, At the time Lhuyd was writing Rug Chapel was writing Rug Chapel would have been a very new building indeed, having been built as a private chapel by Colonel William Salusbury for the Rug Estate in the 1650s. We did actually go down to visit Rug Chapel, but it is closed for the winter period, opening between March and November. Ffynnon Sulien lies on private land, in the grounds of a house of the same name, down an unmade lane, Gypsy Lane, less than half a mile from Rug Chapel. There has been a house on this site, bearing the name of the well since at least 1564. 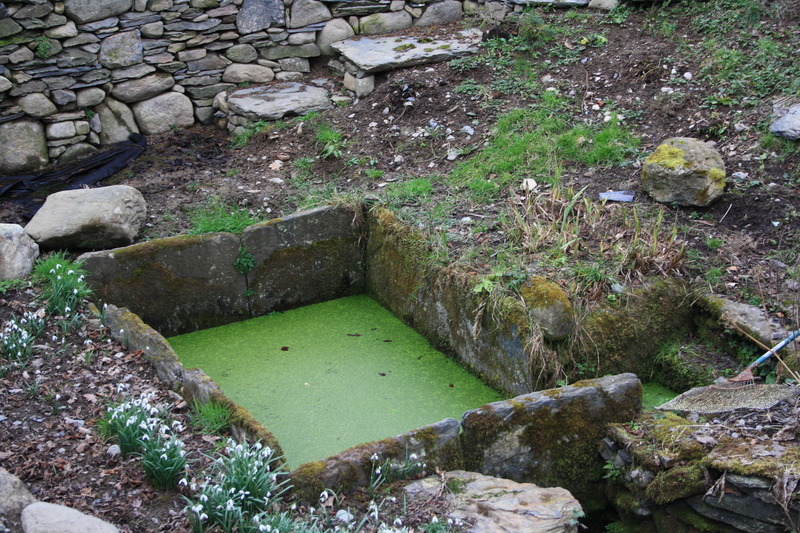 The well is currently being sympathetically restored and landscaped by the occupier of the property. Baring Gould (1908) tells us that water from the well used to be carried to the church in Corwen for use in baptisms, the fact that this would involve a walk of a mile or so. including a crossing of the river may suggest the level of importance that may have been placed on the provenance of the water. On the other hand, the Report of the Royal Commission on Ancient Monuments (1914), whilst not disputing the antiquity of the well, use this physical separation between the well and the village and church to argue against the possibility of this having been the holy well of Corwen. Curiously they also state that Lhuyd’s otherwise detailed description of the monuments of Corwen omits all reference to the well, (although other texts, as noted above suggest otherwise) and they use this to suggest it never had significant links as a holy well with Corwen parish.. The owner of the well understood that water had in the past been taken to Rug Chapel for use in baptisms. Maybe by the 17th century wider interest in the well had waned and maybe it was the estate’s chapel rather than the parish church that by then had closest association with the well. My having to rely on second hand accounts rather than having access to a copy of Lhuyd’s record is a problem here. 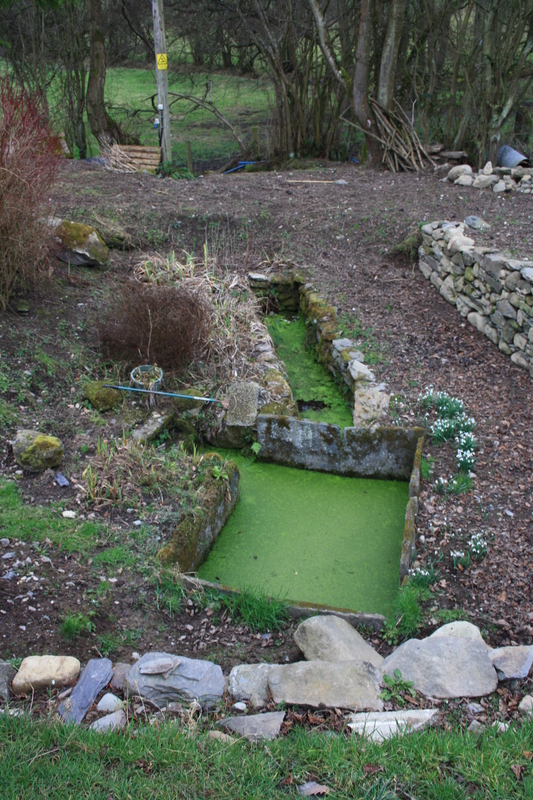 The spring emerges in a rectangular basin, around 12 feet by 6 feet, lined with stone slabs, and with steps down from one side for bathing. 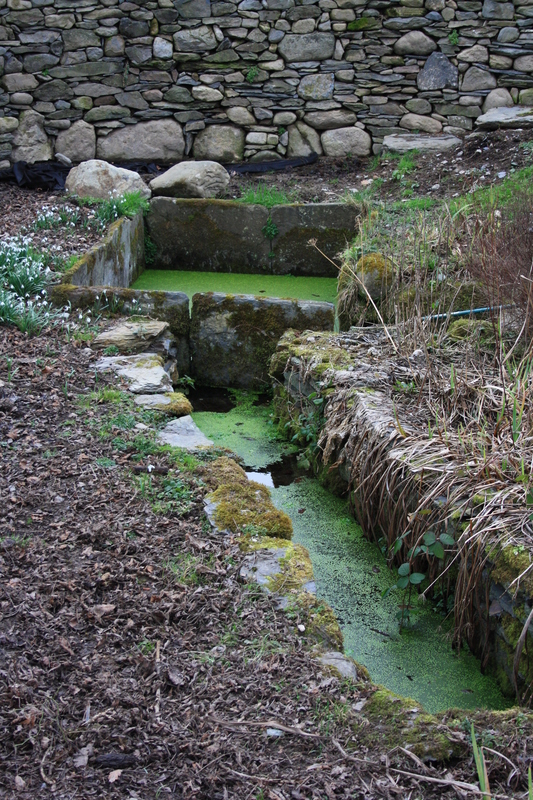 The water then flows out along a narrow stone lined channel. It is recorded that Ffynnon Sulien was also resorted to for cures for rheumatism and arthritis. In common with many wells that were used for baptismal water, it was also used for washing the eyes in belief that it would improve eyesight. Intriguingly, despite these uses, the Coflein record for some reason comments that this is not a holy well. The water today is used to supply the house in whose grounds it stands, being filtered after it emerges and then being pumped to a header tank above the cottage. 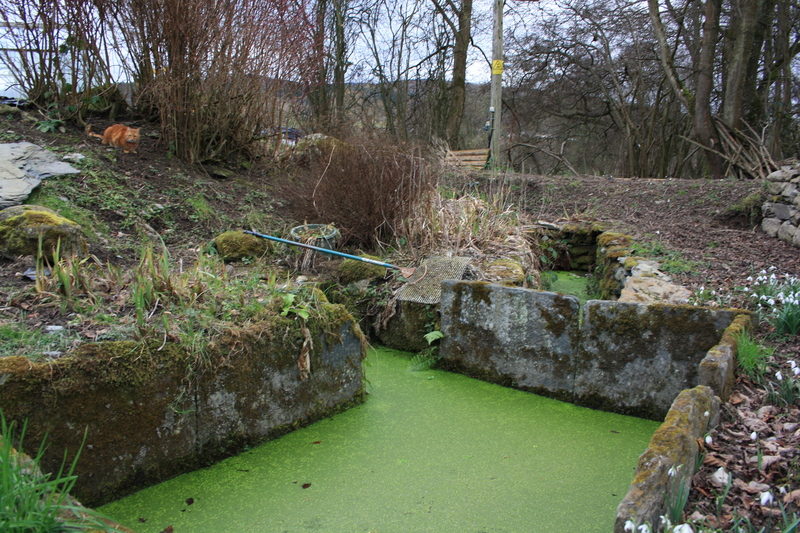 The water is generally clear, although clearly it was suffering from an attack of “ginny green-teeth” on our visit. We would like thank the owner very much for her kind hospitality and for showing us her well on our visit. We promised that we would update her with any new information we discover about her well, and certainly we shall do so – and add it to this post as well. It is nice to realise that the tea she gave us must have been made from water drawn from Ffynnon Sulien. Does the public footpath go through the private property or is it through the surrounding field ?